I have always loved giving experiences as a gift. We have given my parents concert tickets, botanical gardens season passes, restaurant certificates and more. They always enjoy them. I really enjoy giving experiences to my son as well and we have certainly had a lot of fun attending different events or going places that we wouldn’t normally go as part of a special gift to him. However, sometimes getting a certificate can be a bit of a letdown. Young kids don’t always understand what you are giving them and they usually have to wait, sometimes for quite a while, before they get to the fun part. Even for older kids who understand what you are doing, waiting can be hard. To solve that problem, and because it adds to the gift, when I give an experience to a child, I have been giving it as part of a gift package. 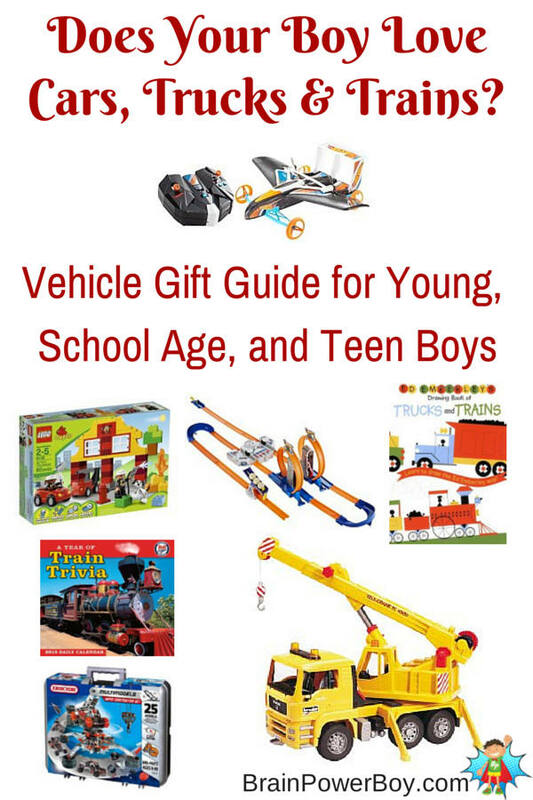 I hope you will find some great ideas in this gift guide for boys. 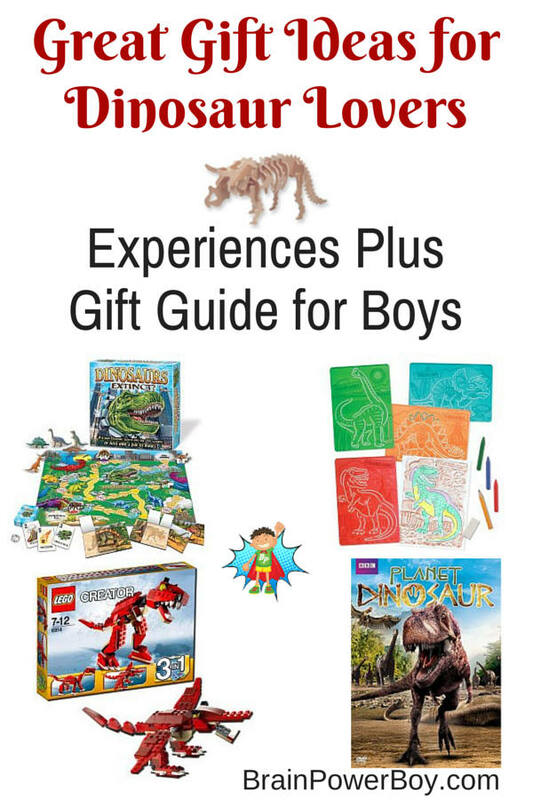 This year I am sharing an experiences gift guide for boys with a twist. 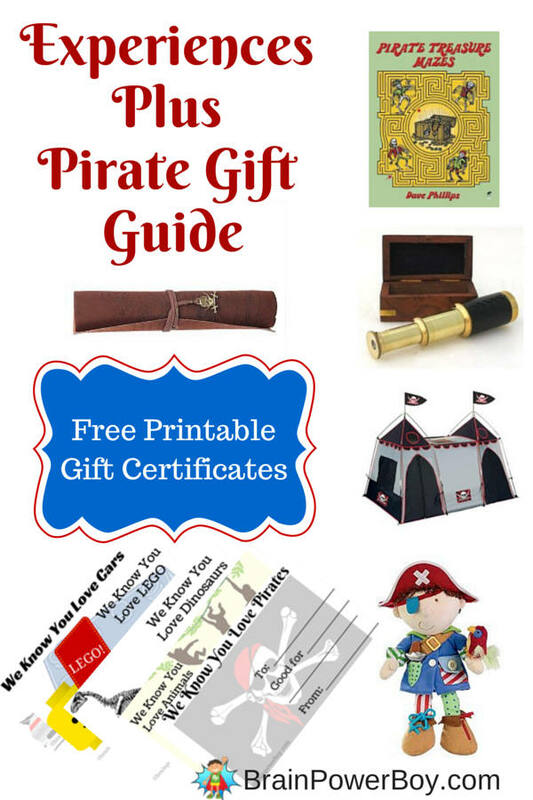 Use these ideas to put together a special collection of items along with a free printable certificates and you are sure to have a winning combo for your boy! He can get gifts now and enjoy the experience in the future. Twice as good! Find experiences ideas and gift ideas for animals, dinosaurs, pirates, cars, trucks, trains, and LEGO. 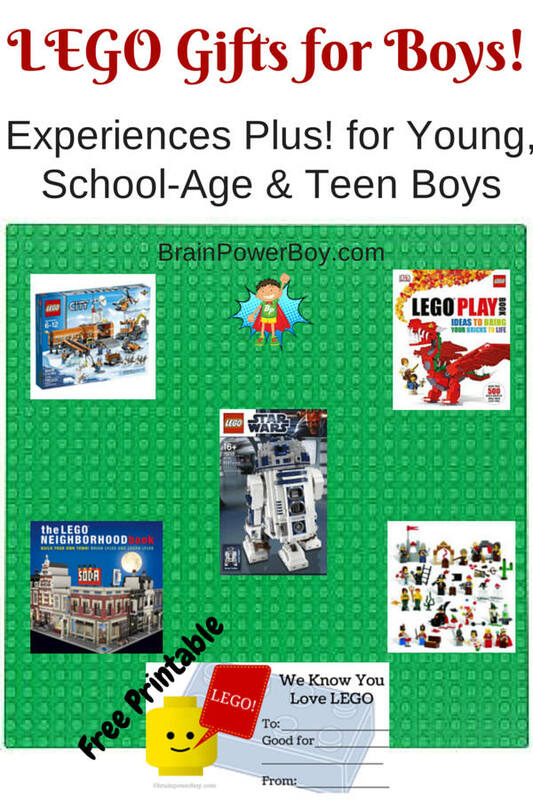 Because this is Brain Power Boy, and we are all about raising boys who love to learn, the majority of these ideas have a learning aspect to them as well. Fun and boys’ learning –a great combo for sure. The selections start with items for younger boys and move up into items for teens. 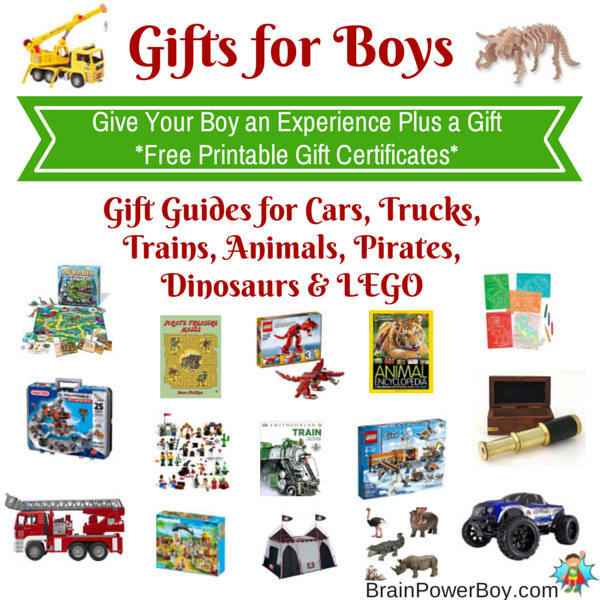 Choose a few ideas that would work best for your boy and pair them with our free printable gift certificates for the experience. You can write in the experience you would like to give him as a gift. Put them all together and you have the best Experiences Plus Gift for your boy! Give him a certificate for a trip to the zoo, an aquarium, a wildlife sanctuary or an animal rescue organization. Make sure to find someone who works there so they can talk to your child. We have done this often and we always learn something interesting and have, at times, gotten to do something special. The last time we talked with a zookeeper and he brought us into a closed exhibit to see the animals and see what they were doing with them. We still have the My Big Animal Book . It is a nice big board book full of great animal pictures. Great for young kids. Cute LEGO DUPLO My First Zoo set with animals, a vehicle and a male zookeeper. We really love this 20 Animal Magnets in a Box set. High quality wooden set from Melissa and Doug in a nice wooden box. One dozen kid size Animal Hand Puppets made of velour. Zoo and farm animals as well as a cat and dog. Best seller. I am a big fan of Playmobil. The sets are high quality, the details amazing and boys can use their imaginations to tell the most wonderful stories. Match the set to the type of experience you are giving. Catamaran with Dolphins (both the catamaran and dolphins float) Animal Care Station , Children’s Zoo or this awesome Large Zoo . There is no beating Schleich for plastic animals. We have quite a few of these and they still look like they are brand new. They are pricey but worth it. Try Schleich World of Nature African Animals , Schleich World of Nature Asian Animals or purchase favorite individual animals. National Geographic Animal Encyclopedia: 2,500 Animals with Photos, Maps, and More! is a detailed book with great images sure to please any animal loving boy. Throw in a game or puzzle for family fun. Try the BrainBox Animals game or Ravensburger Reef Puzzle . Ravensburger makes high quality puzzles and they are our top choice for puzzles. For teen boys I would suggest getting a book that is very specific to their interest in animals. If they like horses find a horse encyclopedia and so on. Get a book that delves much deeper into the particular animal that they want to know about. Here is an example. These Bushnell Bear Grylls Binoculars are rugged, water and fog proof and are the perfect size. Great for when kids need a step-up in gear. The Wild Animals Coloring Book , and the Coral Reef Coloring Book are wonderful for older boys. Yes, they are coloring books and yes, we love them. We also use them as a guide for drawing. Try this book as well. The Art of Animal Drawing is a great book and a total bargain. These Nanoblock Animal Building sets are great for teens. Choose his favorite animals. Give him a certificate for a trip to a dinosaur exhibit at a museum, a visit to an excavation site, or see if an area college has a paleontologist your boy can talk with. Try googling “dinosaurs and your state” to see what other types of experiences you can offer. Dinosaur A-Z and My Big Dinosaur Book are both great for your little dinosaur lover. We really like Melissa and Doug’s stamp sets. They are made of wood and have nice deep rubber stamps with good detail. Dinosaur Stamp Set comes with stamp pad. Or this very nice textured dino stencil pack could do the trick. This 48 piece Dinosaurs Floor Puzzle by Melissa and Doug is a winner. The pieces are heavy cardboard. We love the long floor puzzles they offer. Plastic dinosaur sets were played with endlessly in our house. Sadly the one we have is not longer being made. Try this Schleich North America Dinosaur Scenery Pack or for a less expensive option try this or this . Start with the Ultimate Dinopedia and you won’t go wrong! A game is always a good choice. In Dinosaurs Extinct? board game you are a dinosaur and you have to survive disasters and attacks from T-Rex. Dinosaur Q&A Card Game is a trivia game based on questions about dinosaurs. We have this Tyrannosaurus 3D Puzzle and it is fun to put together. I will say that the pieces of wood are not nicely finished and are a bit rough. Your boy could sand them if he wanted to. We didn’t bother. You could also try this: Tyrannosaurus Rex Skeleton Casting Kit . Dinosaur! is a good choice for a teen who is into them. Very detailed images of what they may have looked like (inside views as well.) Check it out and see what you think. Brachiosaurus T-shirt check the size charts available. There are several really cool dino shirt styles! The Elenco Science Tech T-Rex Skeleton 36″ Scale Replica Model is the neatest dinosaur model I have seen. It will make a nice dec for their room when they complete it. Give him a certificate for a trip to a museum that has pirate artifacts, a visit to a Maritime museum, or take him to see the tall ships. There are even places where you can set sail on a pirate ship replica! The delightfully old-fashioned illustrations of How to be a Pirate don’t disappoint. Your young pirate might also enjoy the books in our Pirate Books for Young Bucaneers post. Get your wee pirate a companion. This Pirate Doll is great! It has a large button, zipper, and shoelaces to tie. If you have the room get a Pirate Hide-Away Play Tent We have a tent (sadly not of the pirate variety 🙂 ) and we have used it a Lot! A Pirate Adventure Magnet set provides storytelling fun for boys 3+. A sharp 6″ Handheld Brass Telescope with Wooden Box is a unique choice. The price is right for this fun pirate-y piece. I wouldn’t expect super optics or anything but I think it is a nice gift. We own it, we love it. Pirate Treasure Mazes Not your ordinary maze book as you need to complete tasks or avoid certain things to finish the maze correctly. Dave Phillips mazes are Highly Recommended! Try a Playmobil pirates ship set. We have had more fun with these toys than any other pirate item we own. Two fun pirate games are Loot and Libertalia , There is always a lot to be learned while playing games. Even the ones of the fun variety. If you have Settlers of Catan, get the Explorers and Pirates Expansion pack! If you don’t own it, consider buying it and getting the pack–excellent game! The Book of Pirates is tops. I put this book in the Treasure Chest of Pirate Books for Boys post I did. It is really good. Read more there. Cars and trucks are pretty popular with many boys. Give a certificate for a monster or a touch-a-truck event for kids, find a way to get him into a construction truck or fire truck or whatever truck is his ideal vehicle. If cars are his thing take him to a classic car show. Many of the people that go to these events love to talk about cars. My son got to chat about the cars and even sit in some very cool classics. Or fill out his certificate to offer to take him to a racetrack. Some events are listed here and here. Google touch-a-truck and your state/or your area to find events near you. For young boys I love these carpet mats. There are various ones available. I recommend getting a carpet one instead of a felt one. Ours still looks like new. Learning Carpets My Neighborhood We used ours for so many play activities including train and car play, lincoln log cities, building farms, zoos and much more. Bruder makes a great line of construction trucks that are high quality and durable. We like Bruder Crane Truck and Bruder Fire Engine . The attention to detail is super! The Science of Car Racing and Batman Science (Batmobile & Batcycle) are both great books for boys. Ticket To Ride is a fun game and you learn a lot as you attempt to visit the most cities in North America. After you ride the rails here try Ticket To Ride – Europe –another winner. These are great for the whole family. We really like Ed Emberley drawing books for getting started on drawing a certain subject. They are simple drawings but you certainly learn a lot as you follow along. Ed Emberley’s Drawing Book of Trucks and Trains . Every year, since he was old enough to read, we have gotten my son a calendar. They are great for encouraging organization and letting them get used to planning their days. Here is a great one for car enthusiasts: Classics: Ultimate Automobiles 2015 Wall Calendar , train enthusiasts: A Year of Train Trivia 2015 Boxed Calendar , and truck enthusiasts too Classic American Pickups 2015 Wall Calendar . Upgrade his ride with this hobby grade RC Truck from RedCat or this cool car that flies Hot Wheels Street Hawk Remote Control Flying Car . Try this Lionel Pennsylvania Flyer O-Gauge Remote Train Set if you have a train loving teen and a place to leave it set up. Ok, I admit that this is my favorite one of all so I saved the best for last! 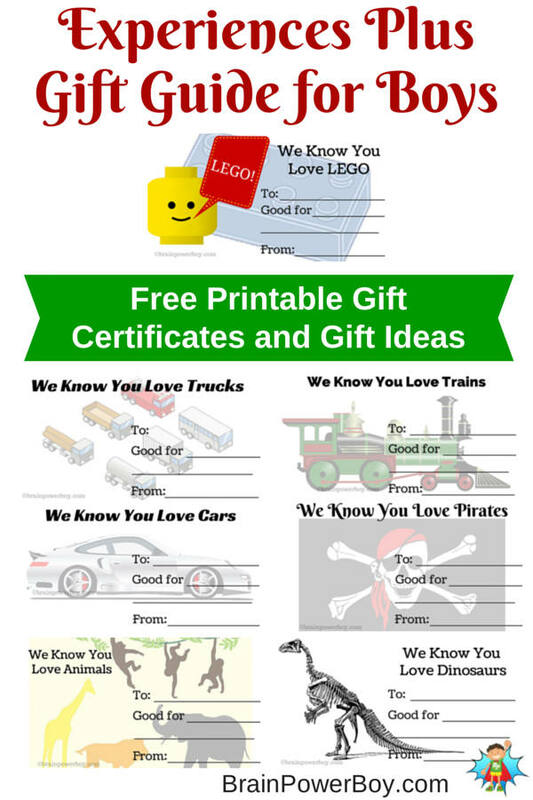 What LEGO lovin’ boy wouldn’t be excited to get a certificate for a trip to LEGOLAND Park or Discover Center, or a BrickWorld Event. The LEGO Store has events as well. You can also give a LEGO class which are offered at colleges and rec centers, or get a group of people together and hire Bricks for Kidz to come and provide a LEGO experience. 1st off get the free LEGO Club Magazine or LEGO Club Jr. Magazine if you have not already done so. You need to become a LEGO Club member (also free.) This is a must have for any LEGO lovin’ boy. It is drop everything time when it comes in the mail. LEGO DUPLO 10572 Creative Play All-in-One-Box-of-Fun is a nice set with a lot of play possibilities. The LEGO DUPLO My First 10552 Creative Cars has two cars, a tow truck and a gas pump. LEGO has a new Read and Build product line. Try LEGO DUPLO Read and Build or LEGO DUPLO Grow Caterpillar Grow . This LEGO DUPLO My First Fire Station looks like a lot of fun. Building plates–apparently you can never have enough building plates, or so I have been told!–LOL. Green LEGO Building Plate , Blue LEGO Building Plate, Grey LEGO Building Plate 15X15 Note: there is a 4 piece building plate set but at the time I wrote this it was more expensive than purchasing them separately. Minifigs. It is all about the minifigs. I know boys who choose sets based solely on what minifigs are included. Here are a couple of great collections that are all minifigs and accessories. The sets are great for open-ended LEGO play LEGO Fairytale and Historic Minifig Set and LEGO Community Minifig Set . We like the fairytale/historical set the best, but that is how we roll. As far as LEGO sets go it really depends on your boy’s interests. Here are our top picks but you should simply ask him what he likes. I have my son tell me several sets he thinks he would enjoy and then we pick which one we purchase. Works out great 🙂 This LEGO City Arctic Base Camp 60036 has a ton going for it. There are a lot of things to build and the open-ended play aspect is fantastic. LEGO Star Wars 75052 Mos Eisley Cantina, and the LEGO Creator Thunder Wings (3 builds–plane, robot and car) would work good as well. I highly recommend The Art of LEGO Design for teens or advanced builders. See our review by clicking the link. LEGO Technic 42022 Hot Rod, or the LEGO Star Wars 10225 R2D2 are all great choices. The absolute neatest gift for a LEGO fan who is growing up is LEGO Mindstorms EV3 . Honestly, so much learning can happen while they are having fun that this is our top LEGO pick. Warning–it is pricey–but totally worth it if your boy likes LEGO, and computers or robotics. If he already has the EV3 you could try these books: The LEGO MINDSTORMS EV3 Discovery Book (Full Color): A Beginner’s Guide to Building and Programming Robots and The LEGO MINDSTORMS EV3 Laboratory: Build, Program, and Experiment with Five Wicked Cool Robots! Giving a gift along with an experience is a great way to make a memory that will last. Plus there is so much learning that takes place by combining and experience with a physical gift. I hope you have found a lot of good choices here. Don’t forget to print the free gift certificates that you can fill out to give the experience of your choice. Note: the printables are a download and are grouped together in one file. They print two to a page. If you only want certain ones, you can choose which pages to print. Enjoy! 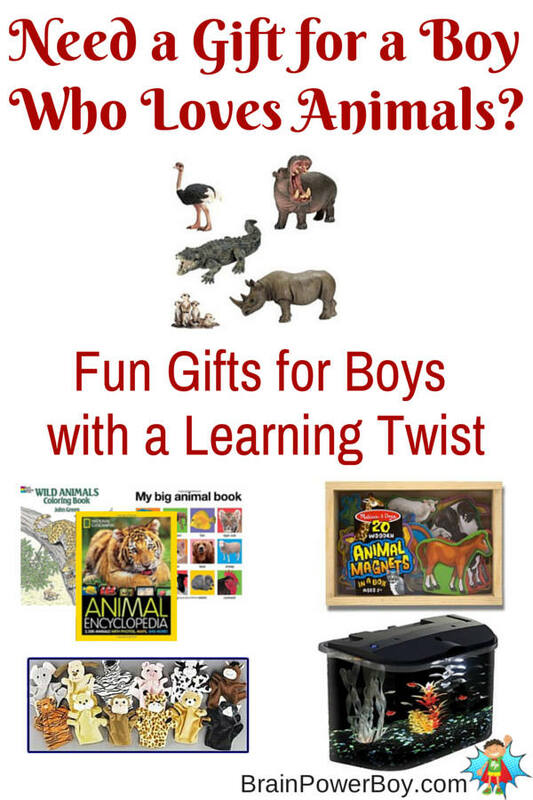 See other great gift ideas for boys. 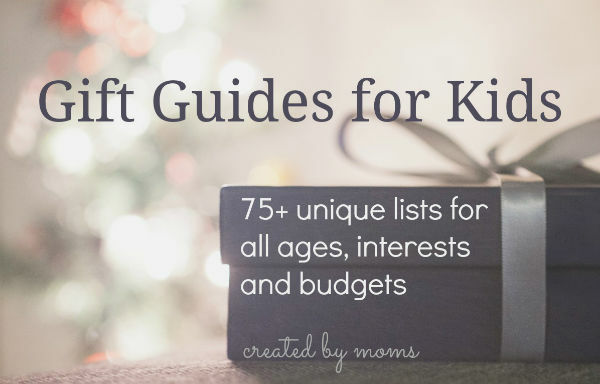 I have joined up with 75+ other bloggers to bring you a great collection of gift guides. Follow this Pinterest Board to see them all or go to the big Gift Guides for Kids page for more ideas. Follow Erica • What Do We Do All Day?’s board Gift Guides for Kids on Pinterest. If you have any questions or need a gift idea for your son who likes a topic that isn’t listed here, please feel free to leave a comment. I am happy to try to help. So many great ideas in this post! I only discovered Playmobil about a year ago, but I love their sets! I love the thought of giving experiences to my boys. These are great ideas for gifts! And I love the printable gift certificates! Thank you Susan. I’m glad you like the idea and the gift certificates too. I love giving and getting experience gifts! I wrote a local experience gift guide last year! Great idea on the homemade gift certificates so givers and fill in their local events or places! I’m glad you like the guide. Thanks much for doing some of your Black Friday shopping through the links–much appreciated! This is absolutely fabulous! Anyone who needs to shop for a boy needs to see this post. Glad you like the list Alli. Hope you find something for your boys. What a comprehensive guide – this must have taken you forever! I love that it’s organized by interest and age. Um, yes it did. I actually said a few times–this is taking forever LOL Glad you like how it is organized. When I was looking for gifts for my son I liked to have things broken down. Wow what an awesome list of ideas! I’m going to pin this so I can come back to it as my boy gets older. So glad you like it Clare. I love the way you have broken this down and offered suggestions for younger and older boys. So many great things on this list.